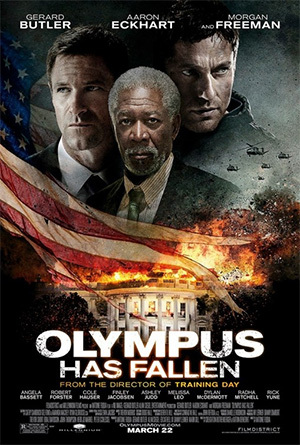 A few months ago I heard about Olympus Has Fallen, a film starring Aaron Eckhart and Gerrard Butler and directed by Antoine Fuqua (who directed Training Day). It’s about a terrorist siege on the White House. 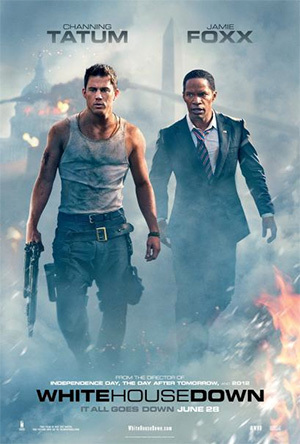 A few weeks after that I heard about White House Down, a film starring Jamie Foxx and Channing Tatum and directed by Roland Emmerich (who directed 2012). It’s about a terrorist siege on the White House. Is this White House siege season? How do two major Hollywood films with the exact same premise get released at virtually the same time? Out of morbid curiosity I downloaded and watched Olympus Has Fallen and saw White House Down in the theater last Sunday to compare the two. The overall premise behind this movie is roughly as ridiculous as the smallest details are. Here it is, in a nutshell: elite North Korean terrorists pose as South Korean politicians and overtake the White House during a sanctioned meet with the President. North Korea “hacks the Pentagon” (pwned you so hard!) and parks industrial vehicles armed with machine guns on the White House lawn and mows down scores of Secret Service agents as if they were novice cadets. The bodies literally pile up on the steps of the White House as one after another Secret Service agent hastily runs out of the open door and directly into enemy gunfire. Then a Lockheed Martin C-130, inexplicably acquired by North Korean terrorists, flies around Washington D.C. in circles while raining bullets down on the capital after effortlessly shooting down a pair of fighters. Once again: a terrorist C-130 shoots down two fighter jets before circling around D.C. opening fire on ground-based targets, including the White House. Instead of embracing it’s own ridiculousness, the film features brutal and crude violence which desperately attempts to convince you that you should take this movie seriously. This movie is like a master class in how the summer blockbuster formula can go wrong. If I’m watching a movie where North Korea effortlessly takes control of the White House, I want the film to demonstrate self-awareness of it’s own preposterousness. This movie is not self-aware and unlike White House Down, there is no Jamie Foxx equivalent to offer comic relief from the overwhelming weight of it’s pile of bodies. Since these two movies have such similar premises it’s really not worth going into great detail about subtle plot differences between these two same-same movies. Honestly, I don’t think anyone cares too much about the plot in movies of this type, they just want to see the White House get blown to pieces and have American flags waving at the end. However, there are some important differences that made White House Down a better film in my opinion. Firstly, the villains in White House Down are Americans. Instead of being an elite group of North Koreans, they’re an elite group of disgruntled ex-Special Forces. They know what counter-measures they’ll face and they’ve been trained by the most rigorous and well-equipped military force in the world. Seen in an extremely generous light, the villains in White House Down are akin to those in The Rock (also known as the best Michael Bay movie). I have to say that blow-the-white-house-up season as let me down a little bit. When seeing both of these movies I assumed the best case scenario was that they’d be like Air Force One starring Harrison Ford (the presidential airplane siege film directed by Wolfgang Peterson). Unfortunately, neither of these live up to that standard. Regardless, the phenomenon of two nearly-identical films seeing release within weeks of each other was a compelling enough anomaly to get me to see them both.